I love savory tarts! These mushroom tarts make a perfect light meal when paired with a salad, or served as a simple yet elegant starter. While they are best when eaten fresh out of the oven, they are also fine at room temperature, making them a great buffet item. Prepare dough as instructed here. 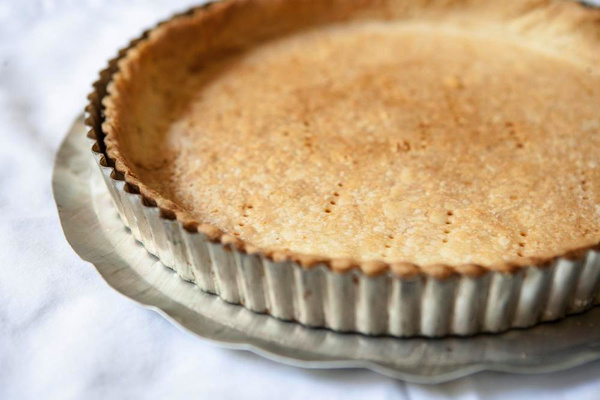 Line the tart shell with foil, and fill with either dried beans or pie weights. Bake in the oven at 350 degrees for about 15 minutes. Carefully remove the beans and foil, and place the tart back in the oven until brown, about 10-15 minutes more. In the meantime, saute sliced mushrooms (about a pound or so) in butter until they release their liquids and start to color slightly. Add more butter and a chopped shallot, and saute for about 5 more minutes until the shallot is transparent. Season with salt, pepper and a little nutmeg, and set aside until the crusts are ready. Crumble goat cheese into the pre-baked crust. Add mushroom mixture. Sprinkle with fresh thyme leaves. Bake in the oven at 400 degrees for about 10 minutes until heated through. Cut into wedges and enjoy!!! Summer tarts are a perfect ending to a great meal. While they are simple to make, adding a creative touch makes them special and personal. I love to cut freeform leaves and berries to top my blueberry tart, instead of the standard latticework. Try your own variation, using flowers, stars or other shapes to create an interesting and delicious tart topper that is truly “upper crust”. Put ingredients into the bowl of the food processor. Pulse until mixed. With the motor running, add ice cold water, a tablespoon at a time until it forms a dough. ( usually about 4-5 tbs or so). Gather the dough into a ball,wrap in plastic, and chill briefly before rolling. Most people suggest chilling the dough for a longer period of time. I find it gets too hard, and prefer to roll it when it is cold, but hasn’t started to firm up yet. I always roll on wax paper that is floured, so I can lift the crust up easily and just peel the paper away. For the top crust, roll the dough out, and cut shapes as desired. While I like to create these by hand, you can also use small cookie cutters to get a similar and more uniform effect. Chill motifs as you go, as those small pieces will be easier to arrange when they are a bit firmer. Mix ingredients. Fill the bottom crust with fruit mixture. Arrange topping elements artfully. Brush with an egg/water mixture and bake @400 for about 50 minutes until the crust is brown and the fruit is bubbling. Be sure to set the tart on a cookie sheet as it is likely to run over a bit. Did you create a unique “upper crust”? Share it with us!